If you like iZombie and candle light then you just have to check out this Liv Moore candle. The whit candle shows the head of Liv and she is eating brains with chopsticks. The iZombie candle is a 3 x 3 inch pillar candle and is just fun as it shows your favorite zombie enjoying her brains and it is ready to have a flame light it. So now you can have romantic candle light and have a reminder of Liv but you also help the world getting rid of a zombie because Liv Moore will slowly burn down with the candle. What does a Despicable Me party need? 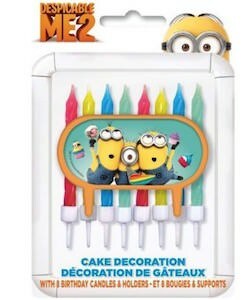 A cake of course that has Minions on them and with this candle set any cake will become a Minion Cake. This set includes 8 colorful candles in candle holders and a orange sign with on that a picture of 3 Minions partying and there are even cupcakes flying around. Any party will be a success when Minions are involved so why not go for this candle set so that your party is all set to become a success. Now you can choose bake your own cake or buy one in store as you know that this candle set will make it all Despicable Me worthy. Come now to order your Despicable Me Minion Birthday Candle Set. Do you get scared when the power goes out? 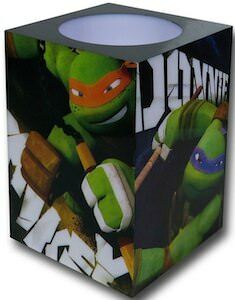 Let the Teenage Mutant Ninja Turtles lite up your room when the lights go out with this cool TMNT flameless candle. This cool Teenage Mutant Ninja Turtle flameless candle features all your favorite ninja turtles Michelangelo, Raphael, Donatello, and Leonardo and they look like there ready for a fight. By each of there picture there names written by each of them Leo, Raph, Mikey, and Donnie. 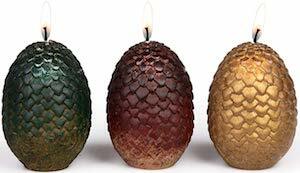 It is a square flameless candle that measures 4″ x 3″ x 3″ in size. A great size to sit on your dresser, coffee table or other areas of your house. Its a flameless candle that runs on batteries so you don’t have to worry about leaving it burning. Feel safe when the lights go out and turn on this cool Teenage Mutant Ninja Turtle Flameless Candle.